Has the true impact of the university been to make direct action impossible? I was lucky enough to share a meal a few weeks ago with a current student at my alma mater, who was embroiled this last year in a struggle over gender-neutral bathrooms on campus that received national attention. After she and a group of her peers forcibly removed gendered bathroom signs from the walls of the student center, several of them faced serious fines and academic sanctions for their actions. The battle came after extensive conversations, petitioning and meetings with administration had failed to get queer and gender-nonconforming students any of the demands they had put forth. I found so many of my friend’s insights profound, as she shared with me everything from the strain that direct action and its consequences can put on the personal relationships of those involved, to how study abroad programs and mental health leave can be leveraged as tools to fracture student organizing and halt political momentum. What surprised me most, though, was when she expressed her feelings of frustration with the ultimate outcome of the action. After all the hubbub, Wesleyan University still failed to set up gender-neutral bathrooms for its students. (Though, my friend informed me, the signs remained down for the remainder of the year, and the bathrooms were continually faced and de-faced with permanent marker by students of various political persuasions.) From her perspective the action had not achieved its intended goal. I shared that from my perspective as an uninvolved alumni, it had been incredibly powerful to see realizations about the university’s priorities become a mainstream discussion, rather than just another opportunity for Diversity U to paint itself as progressive while continuing to alienate poor, Black, Brown, queer, working, immigrant and first generation students. As we mulled the events over together, we realized an important question we were beginning to ask about them: Was the purpose behind this direct action, however small, to transform the university, or dismantle it? I left for college with the expectation of freedom. I couldn’t wait to be among other Brown, queer people who shared my passions, and gain tools for social change I believed I had been barred from in my home town. What I arrived at was something totally different: Instead of being empowered to advocate for my communities in ways I had thought myself previously unable, I found myself inculcated into an insular sphere that, even as it claimed me as proof of its own progressiveness, isolated me from the communities from which I came. It connected me to privileged networks and new accesses that estranged me from much of my family, friends and the spaces which had raised me. In order to fit in and survive I had to take on whole new forms of language and communication, ones that rarely offered me new insights into my experiences as an oppressed person, but taught me that those experiences only had meaning and value if they could be expressed through academic jargon. It became ingrained in me that writing, critiquing, analyzing were the highest-order skills, and that somehow the more of this analysis I produced, the closer I would get to liberating myself and people like me. Living under this jarring new set of values, much of the activism I attempted as a college student looked very similar to my academic work: I gathered with other students to share readings, to teach ourselves on various radical topics, to discuss, to debate. Some of the work I did I was very proud of. But precious little of it was based on targeting the needs of my community with other members, plotting a course of action, and accruing the resources we needed, regardless of what permission we’d been granted. In retrospect, and in light of recent events at my university, reflections on this academic activism reveal to me a crucial new understanding: That the values I was working under, the new things I was learning from the academy, didn’t contribute to my movement building, but in reality ensured that movement building was impossible. When placed in a historical context, our reliance on academic institutions and non-profits is not an organic arrival at welcoming spaces, but an exodus from our ravaged community movements to the best shelters we’ve been able to find—ones neither made by us nor for us, and which have no intention of fomenting nor sustaining movements for transformational social change. What are the lasting impacts JOMO predicts, in which our investment in these institutions in place of our own communities has resulted? I feel this point cannot be overemphasized. The ‘intersectionality’ JOMO refers to speaks not only to the individualistic identity politics that have largely replaced full-scale community movements, but also academic vocabulary. An element as seemingly simple as the language we use to discuss radical change has been wholly hijacked by institutions that have constantly represented the undermining, discrediting and intentional destruction of radical change. We know this language is elitist by definition, yet we continue to employ it to organize our intimate relationships, political alliances, and the futures of our collectives. Yet it’s not merely elitist language we’ve ironically adopted as tools for social justice, but the larger frameworks and values which generate it. Huge sectors of our activism are based almost solely in critique and analysis, preoccupied with terminology, debate and theory. Our work has become focused on making the most airtight, politically correct arguments, and calling out the flaws in the arguments of others, instead of having messy, complicated conversations with the goal of direct action in mind. How often have we had our own experiences belittled or denied because we did not have the right vocabulary to defend them, lacked access to the buzzwords and frameworks of the moment? How often have we been discouraged from or unable to speak for fear of what analysis we had left out, what holes would be poked in our thoughts? 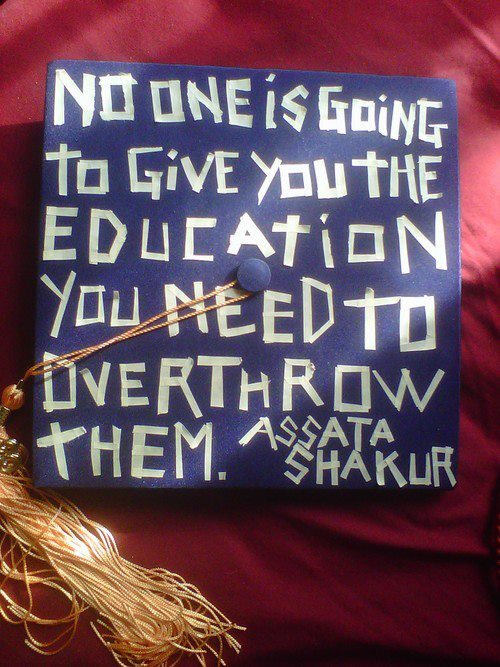 This style of activism—so deeply inspired by the academy—often alienates the exact communities for which it claims to advocate, and ignores the fact that so many of us who are engaged in it are also at the fore of gentrification, consumption and the privatizing of oppressed communities—conversations which occur much less often than ones about ethnic studies and queer theory. Because the academy and the resources it commands dominate our movements in the current moment, we are continuously coerced into seeking its approval and reinvesting in its values. We are rewarded for doing so—with scholarships, with salaried positions, with accolades, with clout, with publications, with degrees, with grants, with tenure, with fellowships. We are reassured by the university that the accruing of these honors and privileges will result in our commanding of our own resources, ones that will aid us in the service of our visions for justice. The reality is that the university and the NPIC gain incredible influence and control over what our movements look like, who is considered a part of them, and what kinds of organizing and action are condoned. We are dissuaded from any action that would threaten the institutions which grant us these privileges, and the more dependent we become on them, the more we fear for our livelihoods in organizing in the ways our communities truly need. Conferences, gallery openings, articles and pre-approved protests become the only outlets for us to make our voices heard. The debacle over gender-neutral bathrooms at Wesleyan University comes at the same time as questions about sexual assault on campus and the university’s reactions reemerge yet again, as well as student protests around the insulting lack of support for the African American Studies program. Will the university respond to these struggles in ways that aid and empower oppressed communities, or ones based on preserving its own power and control? Will justice for women, for queers, for Black and Brown people, ever come from institutions which have only welcomed us when it has been convenient for themselves? As a young, oppressed person who wants militant movements which unite my communities, I do not oppose critical analysis, community discussion, and studied planning for the ways in which we build together. I believe all these things will be crucial in generating struggles which are sustainable, inclusive and effective in threatening the systems which destroy our lives. The issue is that the academy has taught many of us not that these are steps in a larger process of direct action and militant organizing, but that they are the entire process in and of themselves. Moreover, it has taught us that this process can only be carried out on the university’s own terms, with its language, its values, its frameworks, and not the already-existing ones of the communities being affected, those doing the actual organizing. I believe the struggle of queer and trans students at my college is powerful because in an attempt on the part of oppressed people to make the university more welcoming and inclusive, they uncovered something much more potent: That the university is unwilling and unable to include them; That the academy has roots that will always serve as its foundation, and that these have always defined, confined and rejected our struggles for autonomy; That the destruction of property—the literal and not figurative dismantling of our oppression—is exactly what it may take to gain our liberation; That the best way to advocate for ourselves and our communities is to work within them, not removed from them, and that the tools we already collectively possess are the most effective ones for gaining the resources we lack and regenerating community movements; That the university is yet another face of the same structures we must oppose, confront and destroy if we are to be truly free. Thanks so much, RF. I just graduated from Wes, too, and I feel like you’ve well articulated a lot of impressions I had but just didn’t know how to express. Thank you for sharing your experiences, and for corroborating some of mine. I do think there is so much seductive about the language, style and values of that world, and they can be even more so for those of us who feel we are being introduced to it for the first time. There can be pressure to assimilate, but also simply a feeling of power we almost feel we are gaining back. But I also found that for all the power I felt I was exerting through writing and arguing, it never seemed to manifest itself outside of that sphere and the people who were as equally invested in it as I was. Doing rather than theorizing is so important to me, yet what ‘doing’ actually consists of is tricky. I thought I was ‘doing’ while I was writing and producing academic work as a college student, but I feel differently now. I’m interested in direct action, confrontation, but still trying to figure out what that looks like for me and my community. What does ‘doing’ look like for you? Thanks RF. This is a great read. I agree in many ways because I’m a four-time graduate of the western education system so I’ve been VERY indoctrinated in its ways. For me though, not having a community outside of the academy meant that’s all I had-the academy. I agree about direct action, but it’s difficult when you don’t actually have any specific people you are fighting for, besides your other POC/QPOC in academia. I also think that it takes all kinds to build the movement and the artists and writers are as directly affecting change as those who are standing on the front lines and getting thrown in jail, especially now that social media has just a prominent place in our lives. Some food for thought from one of my favorite and most introspective blogger friends. Aw, thank you so much for reblogging, and for your support! I think you bring up some important thoughts. The alienation faced by oppressed people in the academy is definitely something I’ve felt, and wanting to support people who are experiencing it drove much of the activism I experienced and participated in as a student. Yet that focus on queer/Brown/poor people in the academy seems to me like another way of abandoning those who never made it there, for whatever reasons, another means for us to focus our efforts and energy into the academy instead of all the other places it could (should) be going. I think we need artists, scholars, students, historians, too. I also think the people in those roles whom I admire the most–and who have effected the most change–are also on the front lines, also in the community, not merely for research or credibility but because that’s where their work really happens. That we can’t be knowledgable on our own and within the communities we love, that we have to devote ourselves to study, and study on the terms of white/wealthy/colonial institutions is what I don’t believe. This seems to be all that ever happens at Wesleyan anymore. Many times in discussions in classes, meetings, etc. I have had my points and views called invalid due to not using the politically correct terms-even if arguing the same point as others. The conversations always seem to fall into who is the most oppressed as opposed to how we can get rid of the oppression. I fully believe that with all of Wesleyans current problems the students could make a huge difference if groups joined together and went against the school instead of each other. Between that and the general fear of the consequences of any real action nothing will change soon. Wesleyan always loved to cite the sheer number of student groups it boasted when I was a student there. That fact always worked to our disadvantage as oppressed people. We were spread thin, spread out, and constantly working to provide resources–cultural shows, workshops, performances–to the university, rather than using our groups as bases from which we could organize, advocate, and resist the appropriation of our struggles by the academy. It’s not a supportive place for us, and many of us got there by competing with our peers, by following the rules, and convincing folks to do the opposite who may feel they have a lot riding on their position at the school is hard. I support you and feel you. I hope you can find ways to remind folks that the academy–and not merely that one institution–is preying on them, and never providing us half the things that our presence is providing it. But I also have to say that, sadly, the best organizing work and direct action I’ve been lucky enough to be a part of has always happened outside of institutions, always happened with those who either left them actively or have never been a part of them. I hope it’s not cynical, and wish you real luck in building resistance there, but I also hope you build resistance elsewhere, which may be more effective and feasible. Let me know if I can help in any way! Reblogged this on Sara in London..